Groupon has the third most visited retail app in the United States3--behind only Amazon and Walmart--and the sixth highest rated iOS app of all time.4 More than 80 percent of users visit the Groupon marketplace via a mobile device. 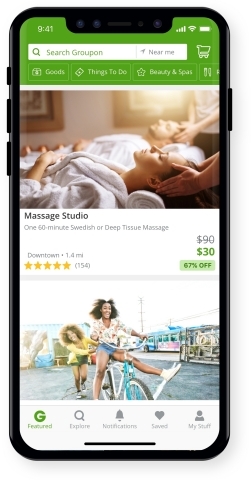 "Groupon, very early on, recognized the disruptive potential of mobile and the power of what it could do for our business, consumers and local businesses," said Groupon's Chief Product Officer Sarah Butterfass. "We're excited to continue to evolve our app to meet the demands of our ever-changing marketplace." Planned mobile improvements in 2019 include using Groupon's proprietary data, machine learning and AI to improve discovery, relevance and service on the platform. Mobile is also a key enabler of Groupon's booking and voucherless initiativesthat make it easier for people to use their Groupons. To download Groupon's top-rated mobile apps, visit www.groupon.com/mobile. "Groupon" is a trademark of Groupon, Inc. All other names used may be trademarks owned by their respective holders.